Teachers union presidents and district superintendents may despise charter school leaders for drawing students away (and, in many instances, succeeding with students who have not done well in their schools), but publicly questioning low-income and minority parents who are trying to find something better for their kids by enrolling them in charter schools has been a no-go. Even in Los Angeles, home of perhaps the fiercest charter school battles in the nation, you don’t hear union chief Alex Caputo-Pearl taking on charter parents. Charter schools, yes, but not the parents. The same goes in New York, where both the mayor and the schools chancellor have been hostile toward charters. But they never question charter parents or wait-listed families. Perhaps as a barometer of just how toxic the entire school-reform debate has become, the high-stakes battle in Massachusetts over whether to allow a dozen new charter schools a year in the worst-performing school districts has pushed some people over that threshold of politesse. Statewide, there are roughly 30,000 parents on charter school waiting lists (a conservative estimate, stripped of multiple applications and carryovers from a previous year). In Boston alone, some 10,000 parents are wait-listed. The response from the leaders of Massachusetts’s two teachers unions? One says those parents need to sacrifice their children (“think beyond your circle” is the precise euphemism employed) for a greater good — at a future time when their neighborhood schools might improve. The other union leader doubts there is a true charter waiting list. In a recent radio debate, Tom Gosnell, president of the AFT-MA, refused to acknowledge that even a single parent was on a charter waiting list. Those lists are “very suspicious,” he told his debating partner, former state legislator Marty Walz, who was speaking on behalf on lifting the charter cap. Even if the waiting lists were a reality, Gosnell said, those parents should dedicate themselves to improving the neighborhood schools they are seeking to leave. “I would say to them: ‘Get in there and advocate for your public schools. Advocate for more resources. They are underfunded,’ ” he said. Although Walz did not have time to respond before the moderator moved on to another topic, she could have pointed out that Boston has the best charter schools in the country, especially when it comes to educating high-poverty students. The very best, such as Brooke charters, have managed to completely level the achievement gap between rich and poor kids. Barbara Madeloni, president of the Massachusetts Teachers Association, takes a more philosophical approach to wait-listed parents. Rather than denying that there are thousands of parents on those lists, she suggested in a radio interview that those parents need to sacrifice their personal desires for what she sees as a greater good: high-performing traditional public schools in all neighborhoods. “I would ask that person to join us in thinking beyond just your child,” said Madeloni in an interview on WBUR’s Radio Boston show. “We are stronger as a community when we think beyond our circle. … As a community together, are we going to be interested in the common good, or are we going to be invested in our individual needs? In short, to the parent of a ninth-grader at Brighton High, Madeloni is saying: Sacrifice your child for a brighter future at Brighton High, however far into the future that may be. Madeloni appears to be making the argument that, for example, building a better subway system would mean some homes would get razed under eminent domain. While we can all sympathize with those displaced homeowners, we can also recognize the logic in Madeloni’s advice: There is a greater public good. The problem with extending her argument to schools is that in Boston, those better schools already exist. Thinking beyond your circle isn’t required. Rather, what’s required is expanding the number of seats in those high-performing schools — exactly what Madeloni opposes. Madeloni is the one who needs to think beyond her “circle,” not us, argue the wait-list parents. Tatiana Garces’s son Jonathan, 12, attends Edwards Middle School, the assigned school for their East Boston neighborhood. Jonathan has suffered from bullying, and the principal there declined to do anything about it, she said. That’s just what boys of that age do, he advised, according to Garces. She would like to send Jonathan to a nearby Brooke or Excel Academy charter school, but the lottery number she drew (47) wasn’t low enough to win him a spot. “I’m not saying Edwards is a bad school. It’s just a bad fit for my son. I can’t make a school that doesn’t fit his needs work better,” said Garces, referring to Gosnell’s advice. Many of these parents have tried their neighborhood schools, only to find their children falling behind in reading or having their disability ignored. They see better schools in their own neighborhoods but can’t win a seat — all because of the cap on those seats that the unions and superintendents are fighting hard to retain. What often gets overlooked is that the waiting list doesn’t include parents who have a child in a charter school but lack a charter high school option – because the cap prevents that. There is no waiting list for them to join. Recently, I profiled Dawn Tillman, a Roxbury mom whose son attends a KIPP middle school. Although KIPP is poised to open a Boston high school on short notice, the cap stands in its way. Her assigned high schools are not acceptable, Tillman told me, which leaves her with no options. “To me, this is really scary,” she said. 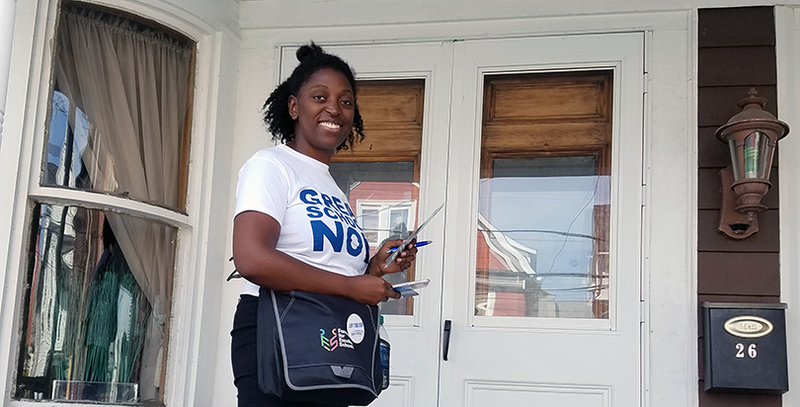 I went door-knocking in Dorchester with Shellina Mathurin, who has two sons in KIPP but a daughter who has been on a waiting list for four years. Hearing anti-charter leaders counsel patience until schools improve does not sit well with her. “How much longer do I have to wait? For my daughter to be a high school senior, and she becomes a statistic of one who did not make it? This is so simple. I don’t see why people make it so complicated,” Mathurin said. Union leaders aren’t alone in opposing lifting the charter cap. District superintendents and school committees, the equivalent of school boards in other states, oppose the cap lift on the grounds that charter schools drain money from their districts. To date, at least 200 school committees have gone on record as being against raising the cap, said Glenn Koocher, executive director of the Massachusetts Association of School Committees. Not one committee has voiced support for lifting the cap. Perhaps. But the parents I interviewed seemed pretty firm about their reasons for signing up for charters. Tillman, for example, said her autistic son was getting no support at her traditional school. All that turned around when he enrolled at KIPP, she said. Janelle Smith of Mattapan knows exactly why she’s trying to win a spot for her daughter, Alorah, 9, at a Brooke charter. She herself graduated from Match Public Charter School in Brighton. Enrolling at Match meant struggling to make up for what she views as a subpar education at Boston’s traditional schools before high school, but it was worth it, she said. And she wants the same for her daughter. Currently, Alorah attends a traditional Boston public school, and she brings home almost no homework. “I’m confused by why she is not coming back with more,” Smith said. If kept on her current track, her daughter will be at a hopeless disadvantage for college, she fears. Smith has entered the charter lottery for the past three years but has never come close. Last year, she drew number 120 for Brooke Mattapan and 79 for Brooke Roslindale. Marc Kenen, executive director of the Massachusetts Charter Public School Association, said telling parents to sacrifice their children while waiting for better schools isn’t realistic. There are no signs of a turnaround that would make that happen. “There’s not the kind of rapid change you would need to avoid losing another generation of children,” he said. 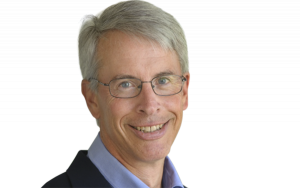 Education writer Richard Whitmire is the author of The Founders: Inside the Revolution to Invent (and Reinvent) America’s Best Charter Schools.